Below is a video archive of Senate Floor Sessions and Senate Committee Hearings that have been televised as of September 27th, 2005. If you are interested in video for dates prior to September 27th, 2005, please contact the State Archives at 916-653-2246. The “Search” field allows for searching televised Senate Floor Sessions or Committee Hearings with or without a specific date range. Entering in key words such as “floor” for a Floor Session or “budget” for the Budget and Fiscal Review Committee, will give a list of all videos with those key words within the title. 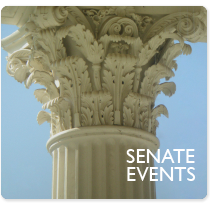 You can find a list of all Senate Committees here. You can also narrow your search to a specific date range using the date fields.